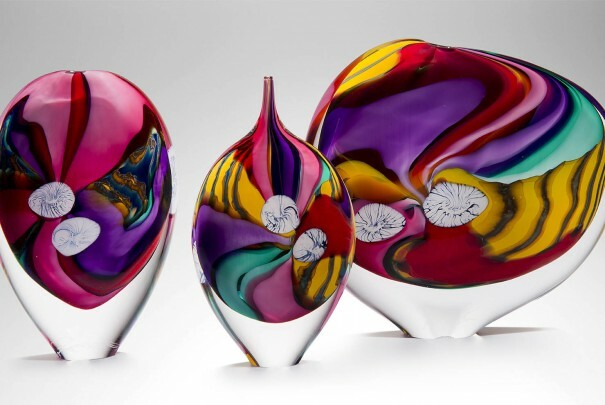 Layne Rowe is an extremely gifted and experienced glass artist who has worked with Peter Layton for over 15 years, during which his approach to colour, form and surface pattern has evolved radically. 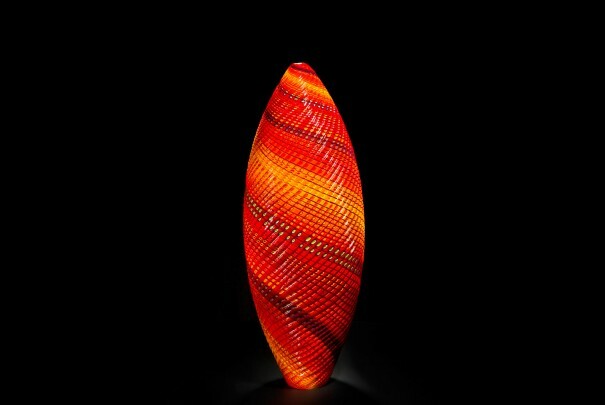 His current preoccupation, inspired by the Devon coastline, has been evolving for several years, and is what he calls his ‘Woven Forms’. 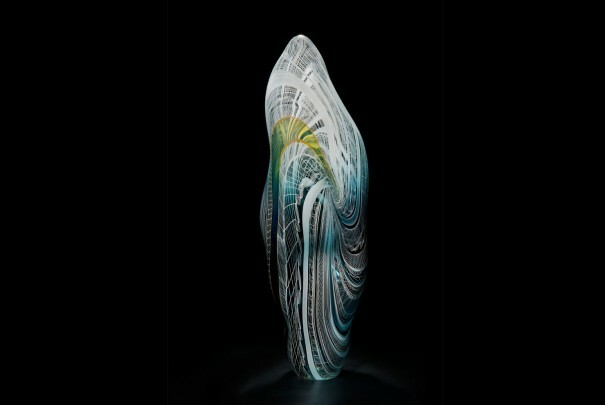 This series of work is a result of intricate layering of different pre-made coloured canes around a molten form that is twisted and, when cold, cut into with a diamond wheel, to reveal vibrant colours beneath the surface. The effect is like water over precious stones or the rock with its glimmering colours beneath reflecting natural growth and corrosion. 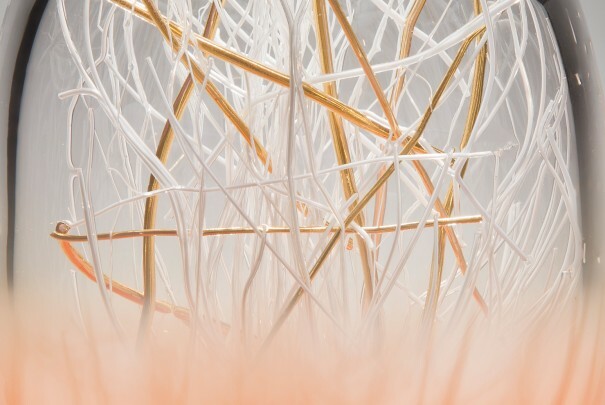 The resulting pattern and texture of the pieces has an extraordinary complexity that demands the close attention of discerning viewers to discover the hidden secrets and subtle delicacy of their intricate detail. 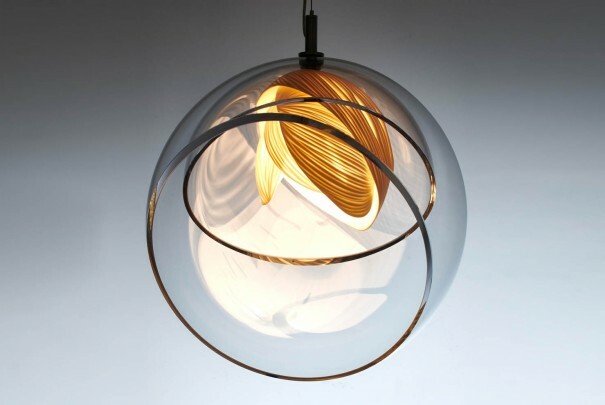 Layne’s journey in glass began in 1994 during his degree course in 3D design at the University of Central Lancashire. 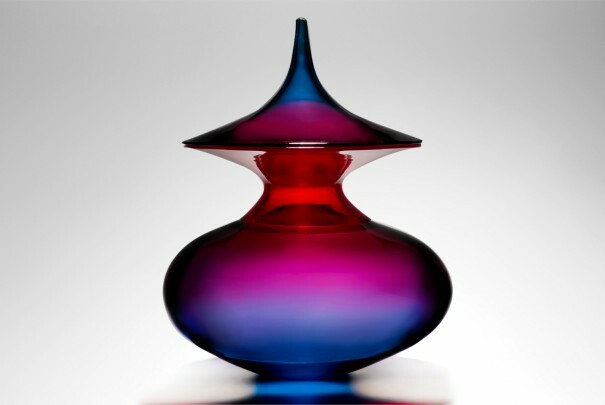 On graduating he worked at London Glassblowing for a number of years before moving to Brazil. 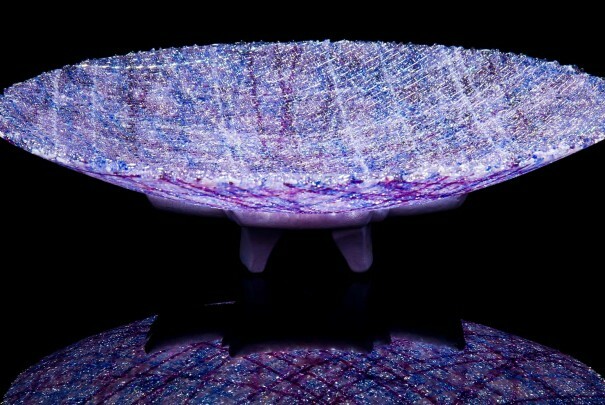 Whilst there he set up a glass studio and another in Hertfordshire before rejoining Peter Layton at the Leathermarket. 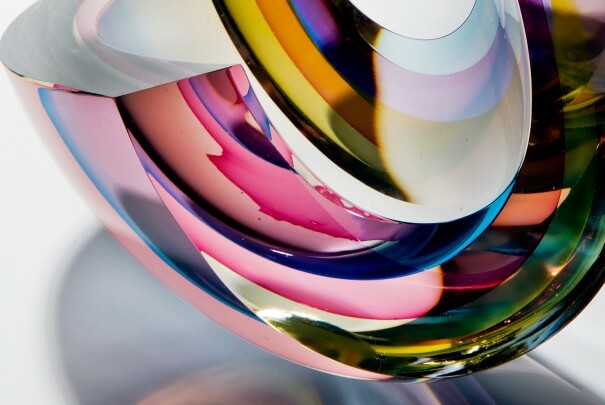 He has worked at London Glassblowing for over sixteen years ‘on and off’. 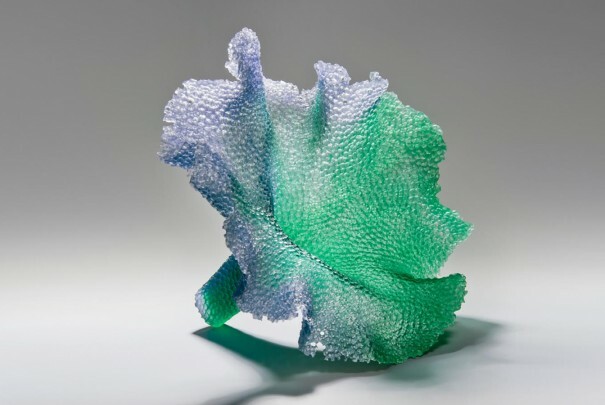 Layne’s work has been widely exhibited around the world, notably in the V&A’s ‘Power of Making’ exhibition and at Collect at the Saatchi Gallery in 2013 and 2014. 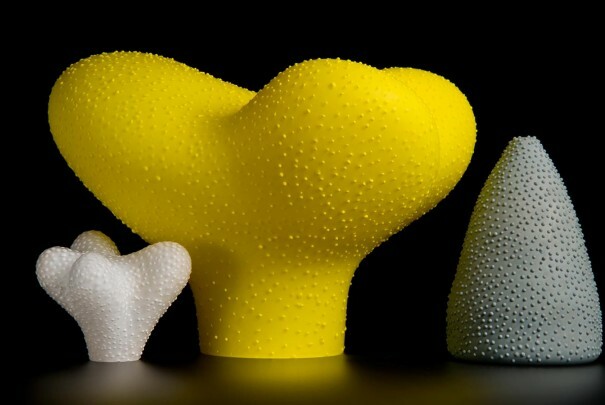 During 2014 he showed alongside Grayson Perry and Alexander McQueen in “Subversive Design”, at Brighton Museum and Art Gallery. In 2015 Layne won the Design Award Bavarian State Prize in the category for cane overlay technique. Regardless of whether you know Layne Rowe or not, chances are you will know his work. His ‘Woven’ series has been one of the most photographed in recent years, appearing on magazine front covers, newspaper spreads and show programmes alike. Complex, intricate and skilful, the success of these pieces has really put Layne on the map. Yet this is no accident. “It’s taken a long time to get to this level of making,” he says honestly. “I have spent years trying out different techniques; experimenting with colours and styles, shapes and forms. Of course, with success comes pressure – pressure to replicate that same success again and again. With an impressive back catalogue to fall back on, he shouldn’t worry. 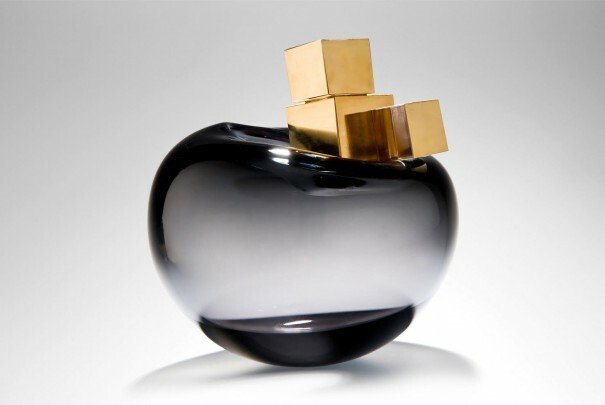 He created a series of violent objects in glass – a gun, a hand grenade – and transformed them into emblems of hope and peace by interjecting flowers into the gun chamber and grenade pin. “Anything can be an inspiration,” says Layne, “but often if you go looking for it that’s when you struggle with ideas. 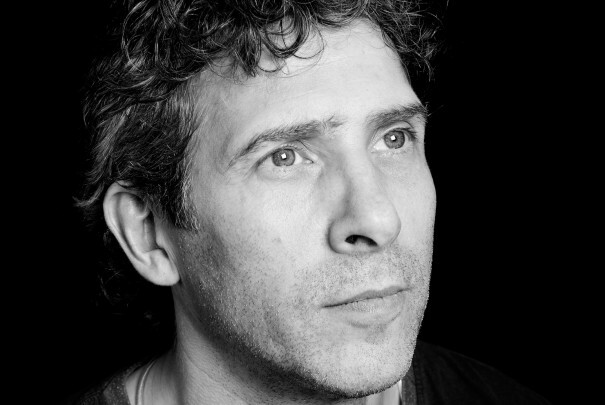 “Sometimes it’s about showing restraint…not getting carried away with an idea you might have which takes your focus away from any current projects. Often it’s more about trusting your work rather than flitting around hoping to pull something amazing out of nowhere. 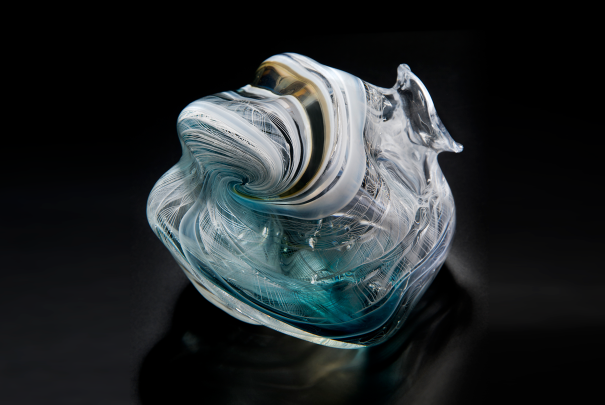 “People think that glass is incredibly vulnerable. That is why I like the shapes I make because people seem comfortable with them. They’re heavy, they work well in a room and they don’t fall over! So what are the trademark characteristics of his works? Looking at Layne’s work it’s easy to agree. 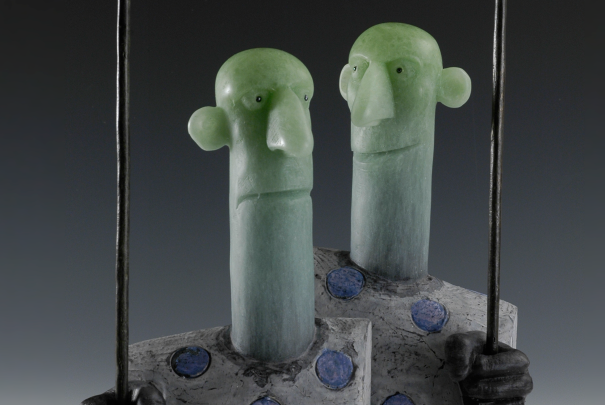 His sculptures are hypnotic, with the beholder seeing more and more the longer it’s held in their gaze. Of course, Layne is equally enthralled by the artists around him. Indeed, he marvels at Peter Layton’s longevity. 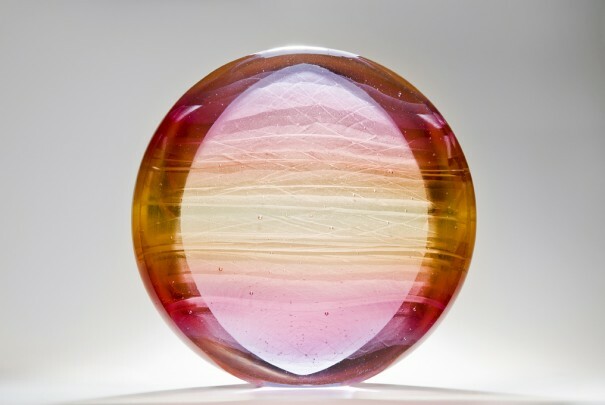 “It’s simply incredible that Peter still has such passion and energy for glass,” he nods. 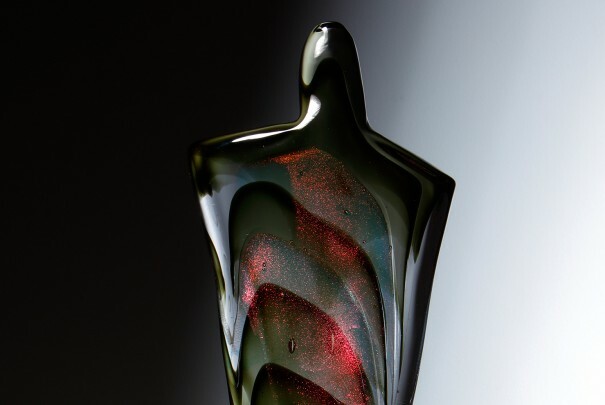 “As an ambassador for glass there is no-one better and he has put this industry firmly on the map. Watch the video below to see a feature video of Layne Rowe shot for menswear designer Hardie Amies’ Neighbourhood Portraits series, in which he discusses his love for the Bermondsey area and his own glassmaking process. Renowned for his hot-chipped technique, James Devereux is a highly skilled artist. 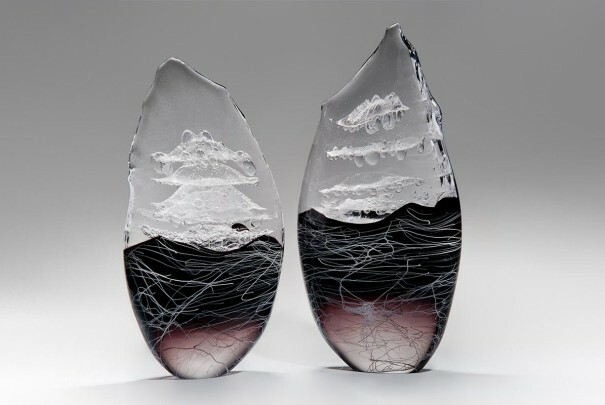 Glass artist Karen Browning demonstrates her mastery of casting in black glass, employing its inky depths to alter perceptions of space. 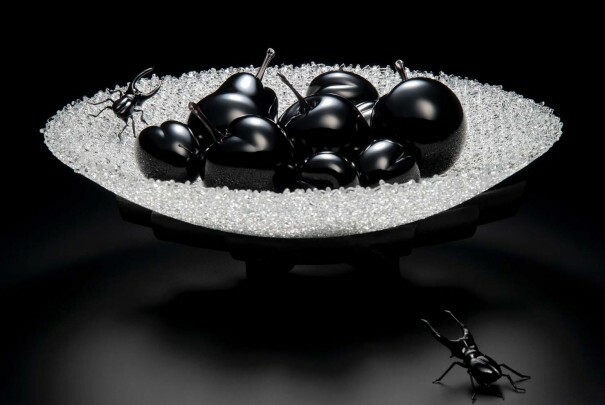 A world renowned glass artist specialising in lost wax casting. 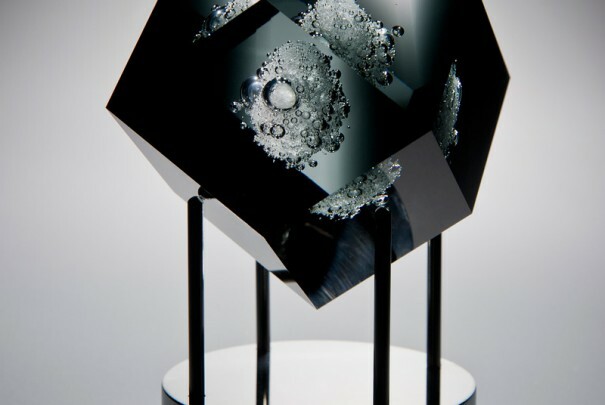 Sabrina Cant’s work is inspired by Celestial bodies and the natural world. 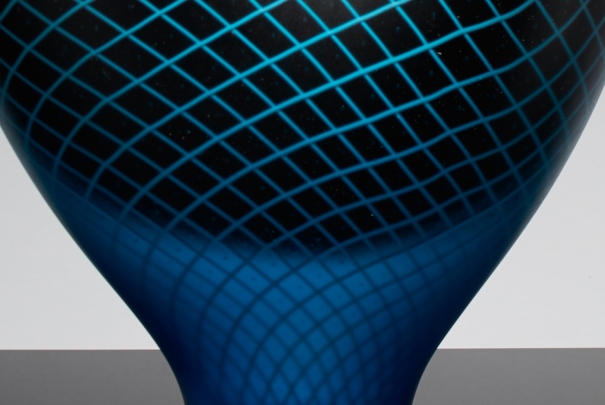 Evoking a complexity in pattern and form usually only achievable through the use of computer aided design. 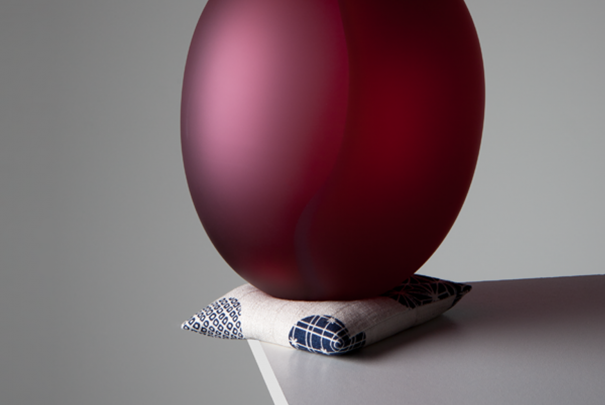 Colourful kilnformed vessels inspired by Welsh landscapes. 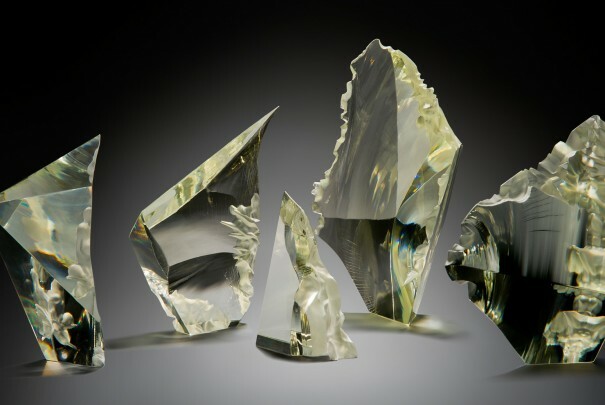 Harry Morgan's work explores the conflicting cultural identities inherent within glass and concrete. 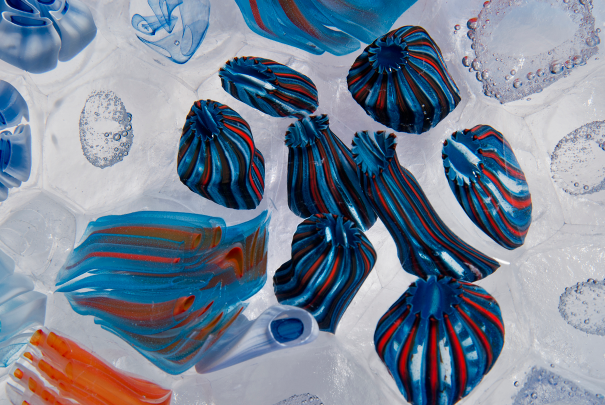 James Alexander imagines a coastal landscape in glass in his rugged yet airy pieces. 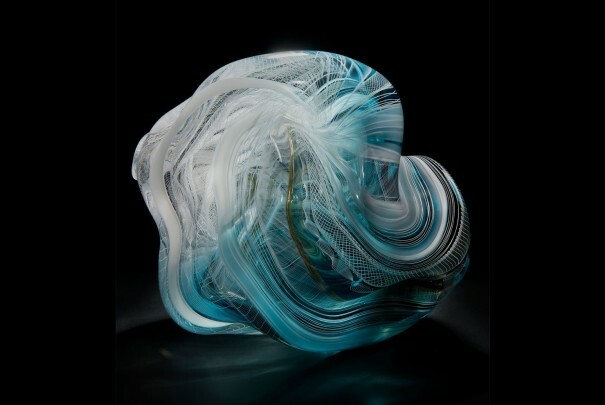 Working in lost wax cast glass, Monette Larsen interprets the sublime beauty naturally occurring in the living world. 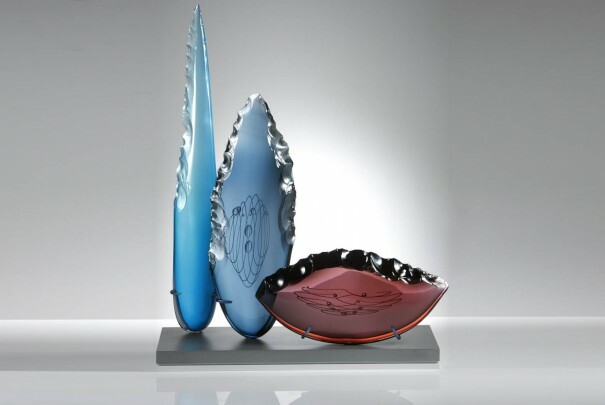 One of Australia’s most accomplished and celebrated studio glass artists. 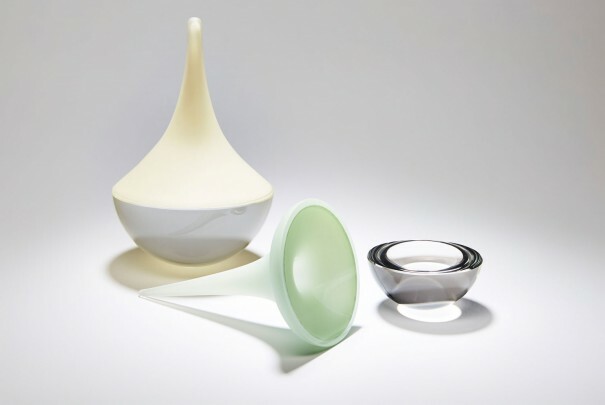 A talented duo who share a keen eye for design, their work is defined by the artful marriage of hand carved ceramics and blown glass.